GREENWOOD—Minutes before the beginning of a holy hour to pray for Archbishop Joseph W. Tobin, Matt Faley talked about the excitement that young Catholics have concerning the archdiocese’s new spiritual leader. Seminarian Benjamin Syberg focused on that desire as he shared his testimonial during the Friday evening event when young Catholics and Hispanic Catholics gathered to pray for the new archbishop. Syberg, who is in his third year of priestly formation at Saint Meinrad Seminary and School of Theology in St. Meinrad, talked about how many young adult Catholics are beginning to shape the lives they want, but they are also uncertain about other areas of life, including their faith. The next step begins with prayer, Syberg said. That openness to a deeper relationship with God followed through the songs that were sung during the holy hour by musicians Michael LaBelle, Brie Anne Eichhorn and Faley. 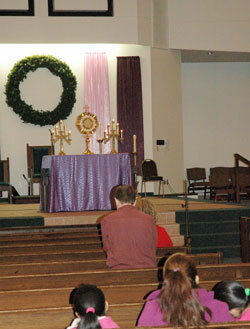 The hour of prayer and music by Catholic young adults touched 23-year-old Jessica Szamocki. So are the members of the Spanish Charismatic Prayer Group at St. Monica Parish in Indianapolis. 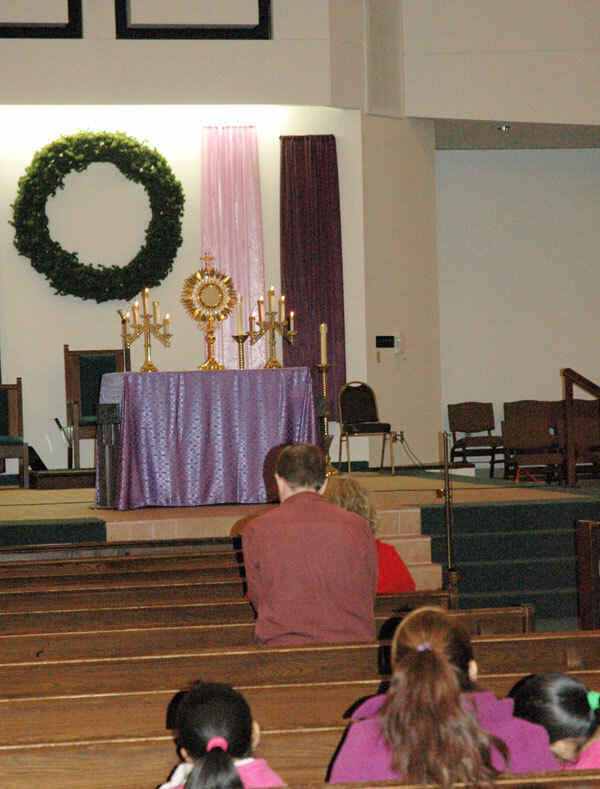 The group held a prayer and music gathering at Our Lady of the Greenwood Church following the young Catholics’ holy hour. Hispanics in the archdiocese are excited that Archbishop Tobin is fluent in Spanish, she said.